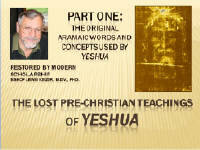 Since January, 2011, Dr. Keizer has scheduled seminars on the Pre-Christian Aramaic teachings of Yeshua for interested groups. 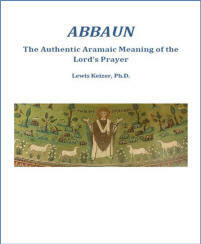 The exquisite kabbalistic teachings of Jesus have more affinity with Buddhism than Christianity. They were misunderstood in the early gentile churches and their New Testament writings. 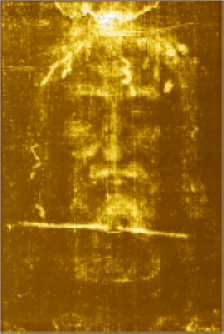 The Greek sources were poorly translated from Aramaic and spun to promote Pauline interpretation about Yeshua as a crucified savior and other Christian doctrines Yeshua never taught. However, modern scholarship has developed methods to reconstruct the forgotten Aramaic teachings of Yeshua, which were rooted in the proto-kabbalistic thought-world of Jewish mysticism, wisdom school tradition, Merkabah ascent, and Babylonian messianic apocalyptic. This workshop will introduce you to the Outer, Inner, and Secret Halakah for Spiritual Rebirth of Mar Yeshua, the Master Jesus. 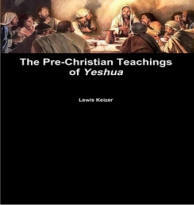 Dr. Keizer is a scholar who has researched the historical message of Yeshua for half a century and published many books and articles reconstructing the authentic teachings. He completed his M. Div. studies at the Episcopal Divinity School with classes at Harvard Divinity School and Harvard University in Cambridge, MA; earned his Ph.D. degree at the Graduate Theological Union in Berkeley, CA; was a member of the faculty at the University of California in Santa Cruz teaching Religious Studies and Classics, and has taught at several other universities and schools. He resigned from the Episcopal Church in 1976 to pursue his Yeshua research and private spiritual practices without pressure to conform to Christian doctrine. He is also a Coptologist and has translated what scholars recognize as the Aramaic Core of the Coptic Gospel of Thomas, which was orally transmitted by an original Aramaic-speaking disciple of Yeshua and rendered into Koine Greek by a bilingual scribe between c. A.D. 30-50. It is pre-Pauline and as ancient and authentic as the Q document, but unlike Q provides a window into the inner-circle kabbalistic teachings of Yeshua. "When I first heard there was to be a workshop offered on the Kabbalistic Aramaic Teachings of Yeshua, I was floored with excitement and enthusiasm. 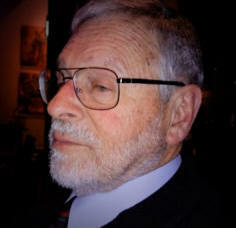 Within a half hour of the presentation by Dr. Lewis Keizer, my mouth was jaw-dropped, eyes wide and ears totally open. I am so grateful for the knowledge, experience and scholarly research that has lovingly become a world offering. It is equally measured by Dr. Keizer's immense spiritual insight and depth drawn from decades of profound spiritual practice and teachings. He offers a life changing workshop and nobody leaves unchanged. Thank you so much." "Bishop Keizer's Lecture and Workshop on the Ancient Aramaic Teachings of Mar Yeshua is a well-documented, fascinating look at a more realistic view of the times and teachings of this great Spiritual Leader and the realization of The New Humanity. Well researched, Bishop Keizer weaves us a detailed understanding of not only the historical aspects of the geographical region and societal microcosm of the times but as well a rich understanding of the interpretations of the teachings as they were presented in their contemporary time and how they still reveal the divine mastery / mystery to this day when studied and then lived. I highly recommend this Lecture series to all who find interest , comfort, and curiosity in the real foundation of what has come to be known as the Christ teachings. The Aramaic Teachings of Mar Yeshua that Bishop Keizer unveils are strikingly similar to teachings that came to me as a child and young adult through spiritual contemplation upon the Master. Leave behind what you think you know from the Bible and bring a notepad and enough funds to buy one of his books. This lecture, while filled to the brim with information, leaves you wanting more." It was great to have Dr. Keizer with us on June 14-17, 2012. Everyone who attended enjoyed not just the information that he provided but also his teaching style. We look forward to having him with us next year. Dr. Keizer's seminar is a wonderfully informative discussion on the origins and meaning of the true historical teachings of Jesus. It is a great inspiration. It is enlightening, practical, well thought out and consummately executed. It will serve to empower your understanding, faith, spirit and will. September 10, 2011: Yeshua Workshop Unity Temple, Santa Cruz, CA. 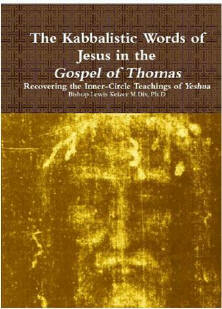 October 22, 2011: Yeshua Workshop Center for Spiritual Living, Santa Cruz, CA. November 5, 2011: Yeshua Workshop Home of Truth, Alameda, CA. August 27-29: Harmonic Intoning and Yeshua Gospel of Thomas workshops. Private retreat for the Ancient Martinist Order of Barbados and allied orders at the Episcopal Church St. Dorothy's Rest Retreat Center, Camp Meeker California. 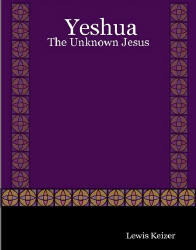 February 24, 2013: Yeshua Workshop in Pittsburgh, PA, venue TBA. Oct-Nov , 2015: GLOBAL TOUR: Yeshua Workshop and Harmonic Intoning Workshop in Ontario; New York City; London; Workshops and Ordination in Wales; Workshop hosted by Bishop Ken Keach, Chang Mai, Thailand; Workshops and Ordination in the Philippines; Groups in Sidney and Perth, Australia; Lima, Peru Workshops and Ordination for students in Columbia and Peru. 2016-2018: Revisioning of Home Temple Ordination Studies in the School of Sacred Studies to transfer much of the Diaconate, Priesthood, and Episcopate preparation curricula to this You Tube site. Much of it is in older Java formats that have become increasingly difficult for students to access. They will be converted from PowerPoint to *.mp4 format and added to this Yeshua You Tube site as either public or private presentations. FINANCES: There is no cost to a sponsoring organization. Dr. Keizer and the non-profit Home Temple pay all travel expenses and provide laptop and projector. Dr. Keizer will offer his autographed books and CD’s for sale at 65% of the bookstore price to defray personal expenses.